When it comes to traveling, I am all about efficiency and comfort. I plan plan plan, allow some for spontaneity (I know, planning for spontaneity pretty much kills it), and make sure that only comfortable clothes and shoes are packed. And what is our favorite vacation destination? Walt Disney World of course. I know, there are some people that just roll their eyes and think that is the worst place on earth to vacation. But you really ought to set aside your cynicism and try it. It is always immaculate and it is truly a magical place. I have been going since they opened in 1972 when I was 5 years old, and my parents took me every 5 years, at age 10, 15, 20, 25, and 30. I missed 35 because I had a 1-year-old, but my most recent trip was for the big 4-0. Brainwashed? Maybe, but who cares when you are having a fantabulous time? 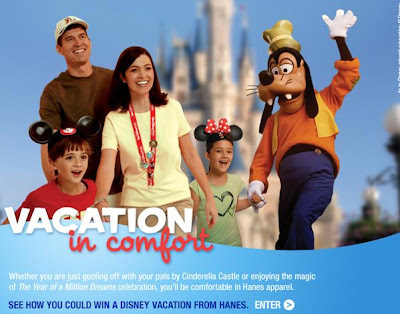 That's why I was excited to hear that Hanes is sponsoring a Vacation in Comfort contest for Walt Disney World. Just buy specially marked packages of Hanes products and visit their site to enter. Since Dova has been assimilated into the Disney Princess cult, we have tons of Disney Princess underwear from Hanes. The contest runs from June through August 30, 2008 and seven winning families will be drawn around September 21. While your at their site, check out their travel tips for Walt Disney World and vacationing in comfort. All good stuff I totally agree with.